The Barris built 1952 Mercury hardtop known as The JAPAN was featured in a series of step-by-step stories on building a custom. The three and a half month restyling project resulted in a beautiful TOP TEN mild custom. 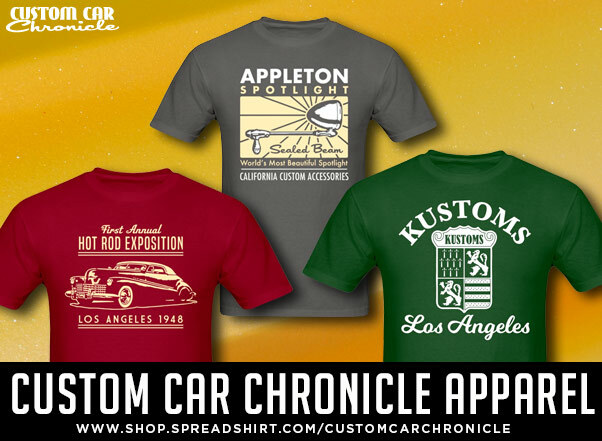 By 1955 the custom car craze had spread across the nation. Many “would be” customizers had been reading magazines like Rod and Custom , Car Craft, Hot Rod and others where they were getting ideas for building their own customs. However, many of these young customizers lacked the opportunity or resources to take their cars to a well-known custom shop like Barris Kustoms in California. 1952 Mercury from the original sales brochure. 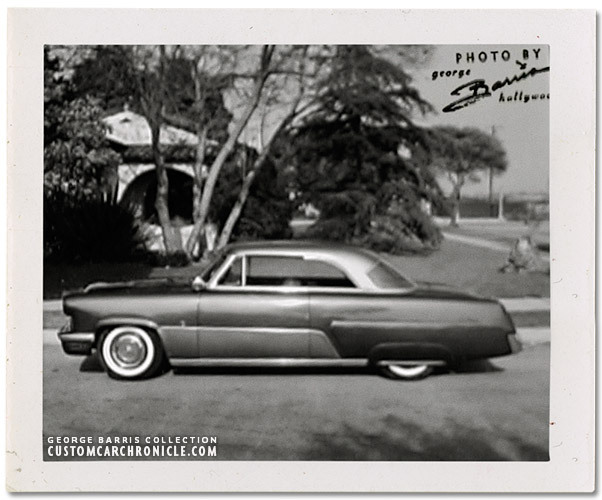 George Barris took the Mercury to his favorite location, the house on Abbott road, not too far from the Barris Kustom Shop for a photo-shoot. 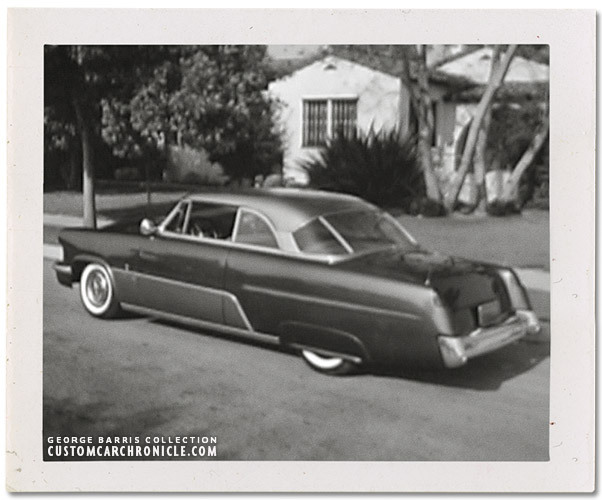 The 1955 “How to Build a Custom” series in Car Craft magazine by George Barris provided photos and instructions on performing some of the “basics” of building a very desirable mild custom. Granted there had been lots of “how to articles” in the magazines before on various and assorted modifications. 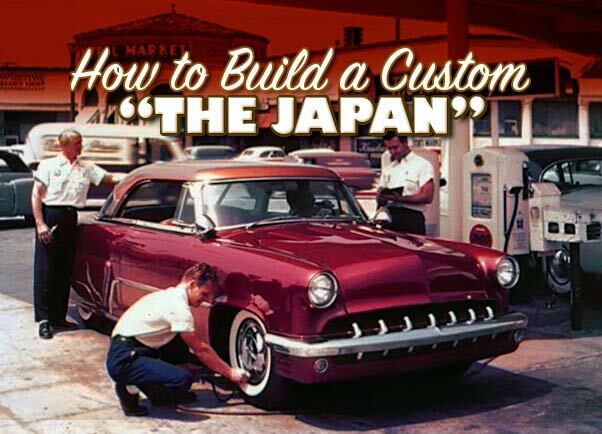 What was special about “How to Build a Custom” was that it took the reader through the process of restyling from beginning to the finished car in an eight-part monthly series. 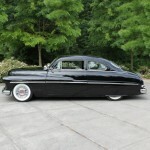 The ’52 Mercury hardtop was owned by Tom Jeffries and he brought it to the Barris brothers for the customizing in 1954. 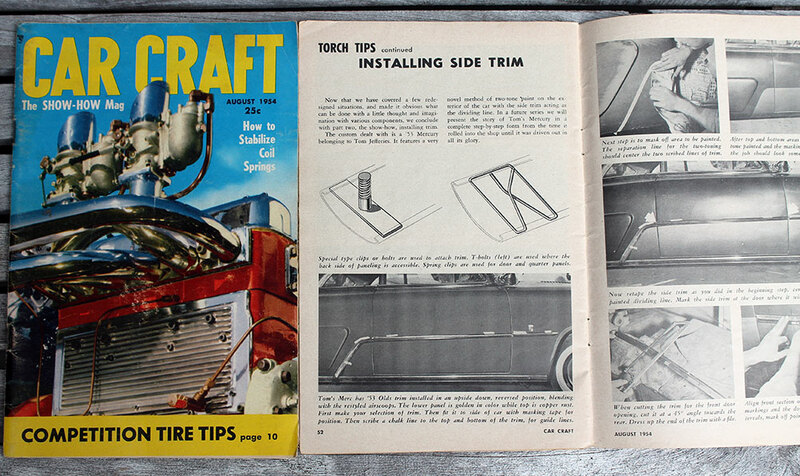 Car Craft magazine first shows the car in a story titled “Installing Side Trim” in the August 1954 issue. The story mentions that Tom Jeffries Mercury will be featured in a complete step-by-step form from the time it rolled into the shop until it is driven out in all its glory. 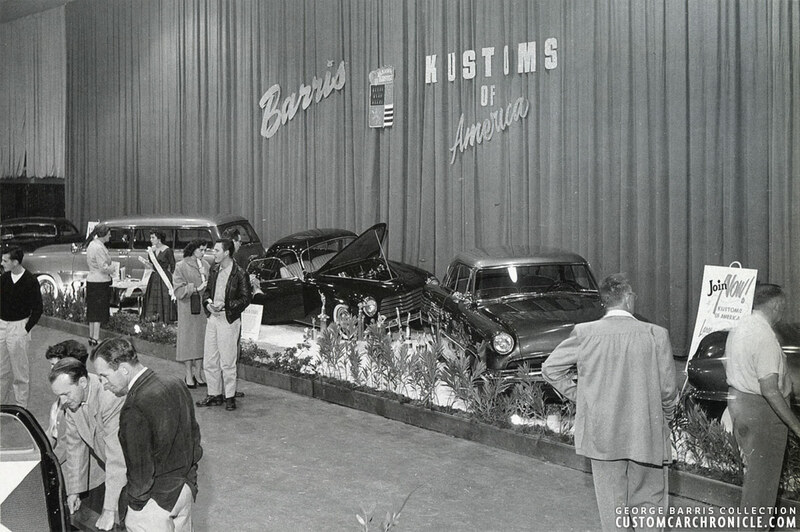 The pictures in the story show an almost completed car with the Barris emblem on the front fender. 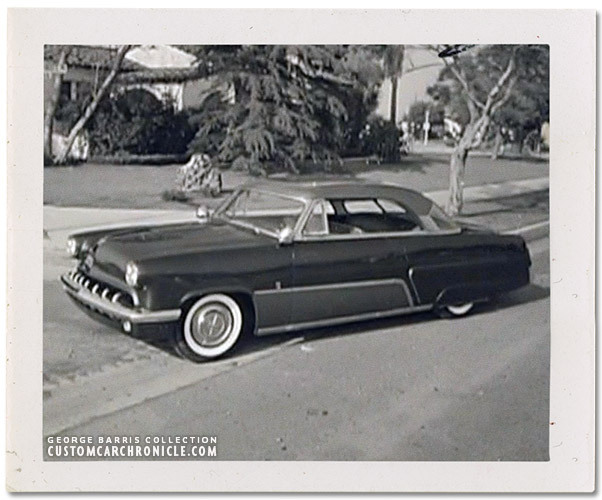 Car Craft had been planning to do a “how to do it” custom series and probably reached out to George Barris. 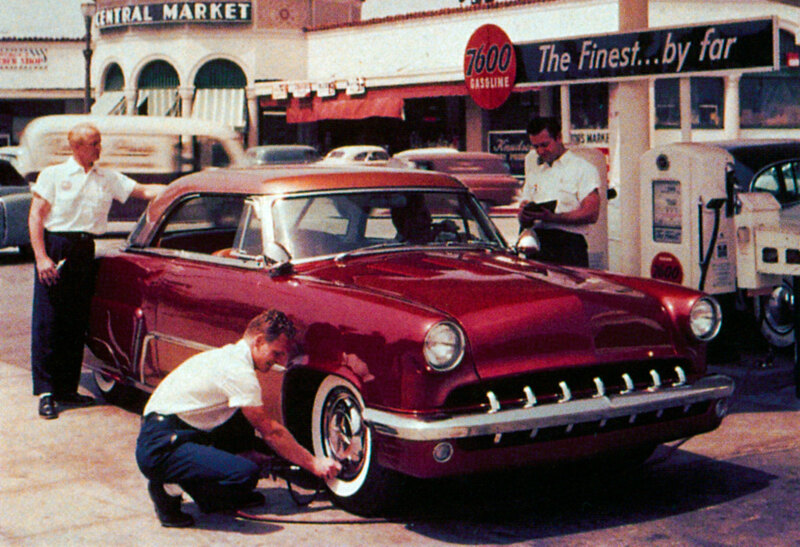 The ’52 to ’54 Fords were becoming popular for customizers at the time of the articles. George Barris in Volume 1 Barris Kustom Techniques of the 50’s said, “The ’52-’54 Fords and Mercurys quickly became popular cars to customize and we chopped a number of them.” This one would be a mild custom but represented a model of a car that was currently popular in 1954-5 when the articles were published. 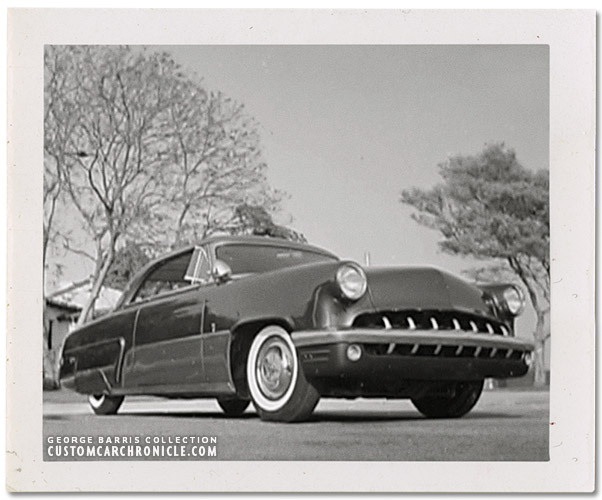 It was interesting to note that the first magazine article in the series mentioned that this body style was similar to Mercury’s ’52 to ’54 and ’52 to ’54 Fords as well. It was important to show that these modifications were applicable to a wide range of cars. The series of articles featured many modifications such as shaving the door handles, removing trim, frenching the head and taillights, smoothing bumpers, etc. that could be done on any make of car. In writing the “step-by-step” articles for Car Craft George Barris stresses how much money the reader could save by doing the work themselves. In the final story he mentions that the custom work took 3 ½ months at a cost of $1300. He goes on to say that $800 of that total was in labor which you could save if you did the work yourself. I had to laugh when he mentions that frenching the headlights at a shop would be a $20 to $25 job, but you could save that if you did it on your own. However, in 1955 twenty-five dollars was a chunk of money for some young guys! Style wise the modifications to Tom Jeffries’ Mercury were tasteful, fresh, and unique for that era. 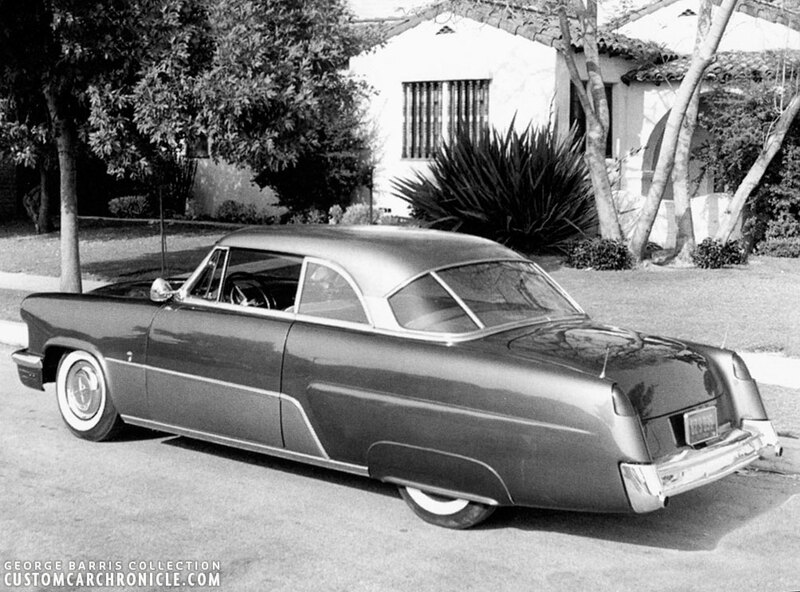 The taillights from a ’51 Fraser seem to fit the top of the rear fenders perfectly, while the ’54 Olds side trim turns down and mimics the dividers in the 1952 only, three-piece rear window. The air scoops added to the hood and rear quarter panels were a nice touch. The smoothed rear bumper with exhaust tips complements the pleasing ¾ rear view. I always liked the photo used at the beginning of part 4 with that same view. I also think the’54 Chrysler hubcaps, which hadn’t been used a lot on customs in this era, were a good choice. The grille bar restyling along with the molded opening and painted lower bumper make an understated, very clean look. 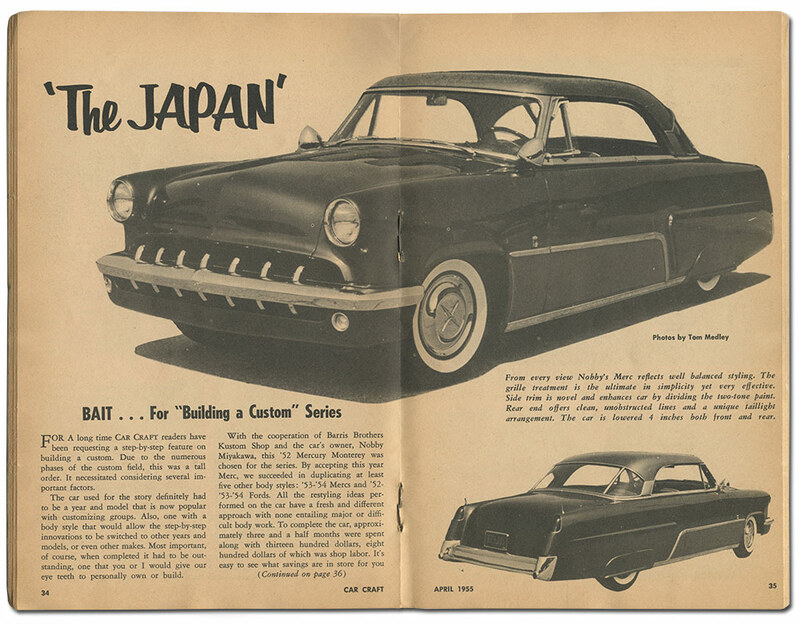 Along with the modified scoop and frenched headlights the front end restyling shows very well on the May 1955 Car Craft cover and in the April 1955 feature, “The Japan”. 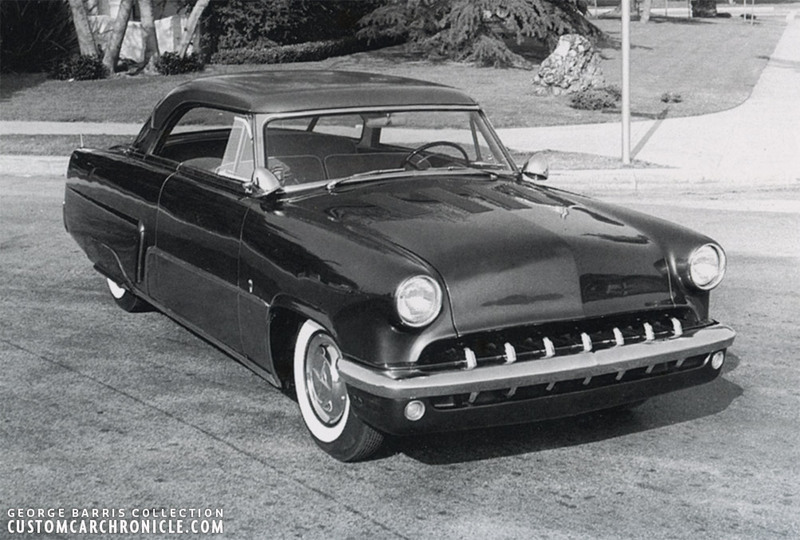 One of the most dramatic changes to the car were the addition of the ’52-53 Lincoln grille teeth (These teeth are sort of “hidden” below the bumper on the stock Lincoln) in the smoothed grille opening. This created a much more aggressive front end on the car. Stock 1952 Mercury front 3/4 view from the original Sales Brochure. The color pictures of the eighteen coat lacquer job look outstanding. Copper rust metallic and gold bronze metallic were the colors selected by Barris and the owner. Although, it wasn’t until part three of the series before the readers finally got to see it in color on the cover. That picture doesn’t really show how outstanding the two tone paint job really was. Sometime later the Mercury was selected as “Ten of the Best” by Car Craft magazine. The owner was listed as Tom Jeffries and his $1500 custom. However, when the feature on “The Japan” was printed the owner was listed as Nobby Miyakawa. Maybe he purchased the car shortly after it was finished from Tom Jeffries? The crew at the Barris Shop painted the Mercury in what George Barris described as Copper-Rust Metallic and Golden-Bronze Metallic. This is one of the two color photos I have ever seen on this car. The ’52 Mercury “the JAPAN” was also part of the Barris Display at the 1954 Petersen Motor Revue & Motorama at the Pan Pacific Auditorium. There is no way of knowing how many cars were restyled using the information and techniques shared by the Barris Kustom shop in these articles. My guess is that the series was very informative to both other shops and to the “do it yourself” customizers working at home. I tend to think that a number of cars were modified using some of the techniques shown in the Car Craft step-by-step customizing series. I don’t have any information on Nobby Miyakawa and how long he owned the car. As I mentioned earlier the owner was listed as Tom Jeffries when the series began, so at some point Nobby became the owner and must have been the inspiration for the Mercury’s name, “The Japan”. The April 1955 issue of Car Craft Magazine had a full four page feature on the Mercury. And on the following spread the first installment on the Her’s How: Building a Custom article was started with another 4 pages. The second spread of the feature article, and the two spreads introducing the How To article starting with frenched headlights. 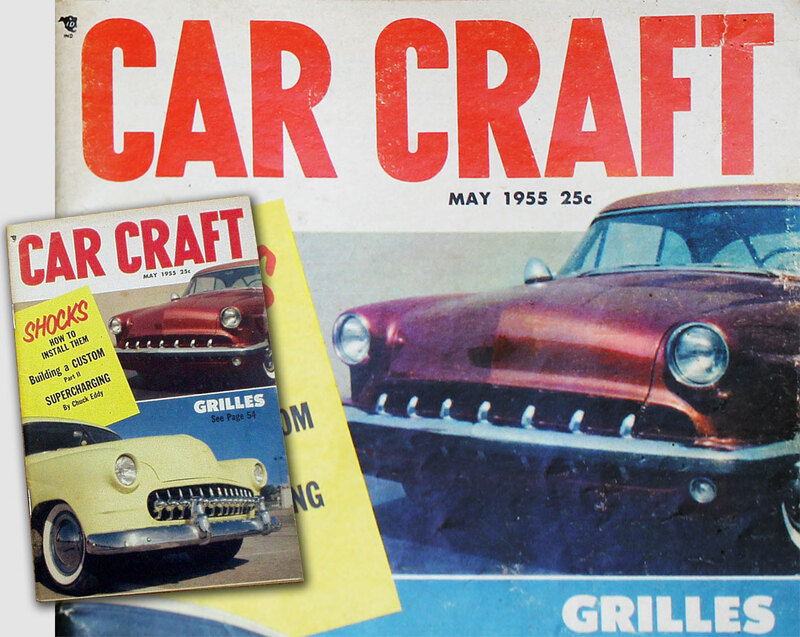 August 1954 Car Craft issue showed how the side trim was created. 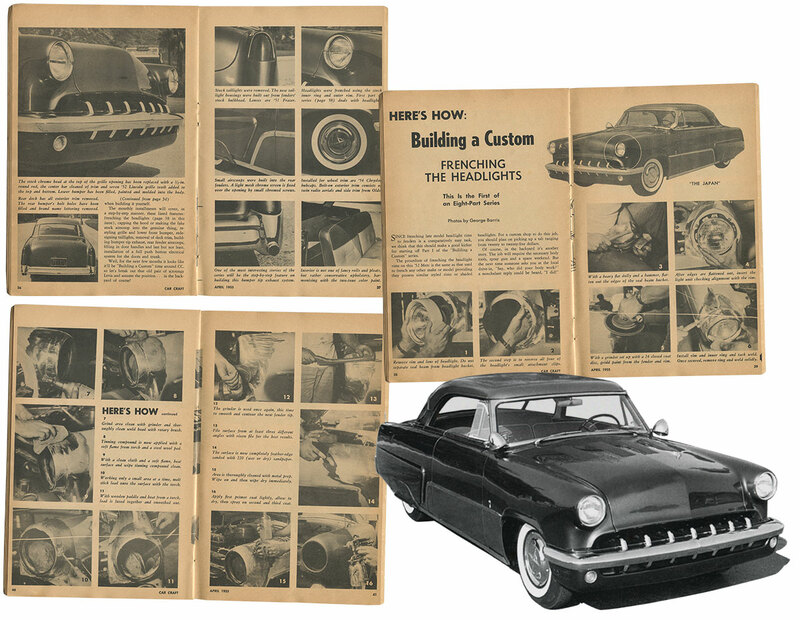 A few of the covers of Car Craft magazines that had parts of the How To features of the Mercury. 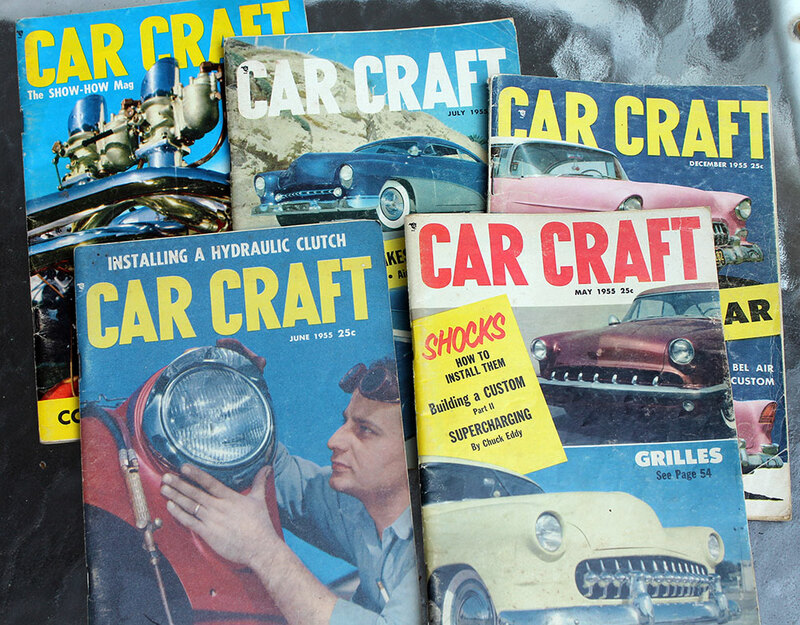 The May 1955 issue of Car Craft showed the front section of the Mercury in color on the cover. The biggest question though is perhaps what happened to the beautiful ’52 Merc known as “The Japan”? It wasn’t seen in the magazines much after 1956, it just disappeared? Maybe one of the readers knows more about where “The Japan” Mercury ended up? Epilogue: I have long been a fan of this particular ’52 Mercury custom and the series on it in Car Craft about its construction. I want to thank Rik Hoving for preparing a file of information and pictures on the Jeffries/ Miyakawa custom car which I used to write this story. So glad you brought this classic custom back to our attention. I’ve always thought it was what a mild custom should aspire to. Nothing over the top; all refinements complemented the overall original form of the Mercury. Thank you. Nicely done story on a Mercury model I have always really liked.